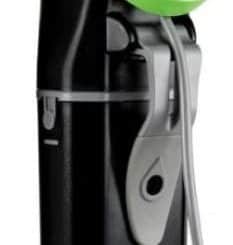 The Nomiku WiFi Sous Vide is a good quality model with a lot of desirable features, however at it's current price it isn't a good value compared to other models. Be careful choosing this model, see the full review below for more information. High capacity and flow rate. $199.99 Current Price - YOU SAVE $76.92. When we reviewed the Nomiku WiFi Sous Vide Immersion Circulator we were impressed with its compact design, elegant display, high wattage and good flow rate. However, when we compared it to other models that were similarly equipped, the value wasn't there. 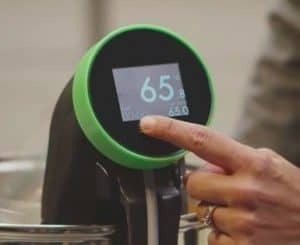 UPDATE: After this review was written, Nomiku seems to have made a change in direction and has stopped producing sous vide machines and switched to a home food delivery business. We would be very careful about choosing this model. The Anova Wifi Sous Vide has WiFi and is a much better choice. This model is 13.5" in height it has a standard strength housing and a polycarbonate tube housing for the heating unit. This model puts out 1100 watts of power, which is higher than the average for the models we reviewed. It has a flow rate of 1.5 GPM, which is higher than 2.0 GPM average for the models we reviewed. This high power and high flow rate on this model means you will have to be much more vigilant about the water level on extended time cooking projects. The high power and flow rate of this model means it will reach your set temperature a lot more quickly than most models. The price and value were our biggest gripes with this model. At the time of testing the price was $199.99 , almost double that of our highest rated model the Anova Bluetooth Sous Vide for $129.00 . The Anova is Bluetooth and this is Wifi so that does account for some of the price difference, but this just feels overpriced, compared to the Anova Wifi Sous Vide which also has Wifi and is only $153.33 . 13.5" x 6" x 2" 14.8" x 2.8" x 2.8" 11" x 1.9" x 1.9"
The Nomiku WiFi Sous Vide is an expensive older model that's no longer being manufactured, we recommend the Anova Wifi Sous Vide instead.